Wow, the past week flew by and it is already time to check out the top three most viewed links from last weeks Wow party. 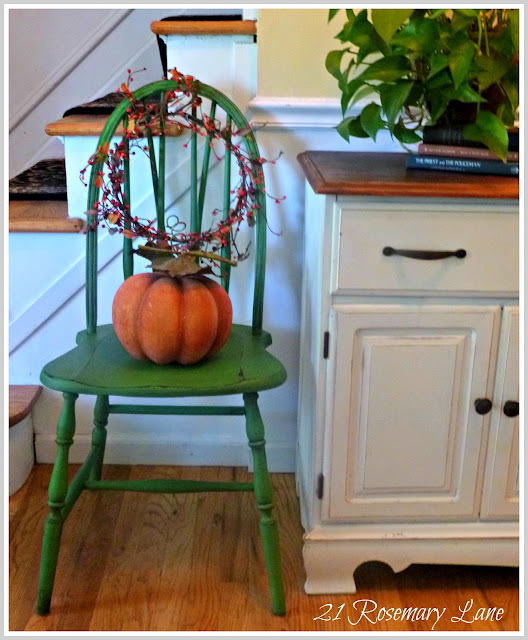 Barbara of 21 Rosemary Lane shared her fun fall entry. This was the most viewed link with 465 views. Coming in second with 349 views is Marty of A Stroll thru Life. 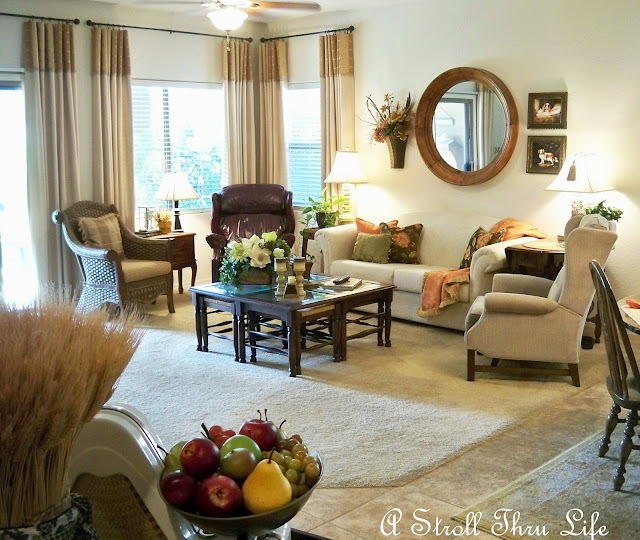 She shared how she has been adding fall colors to her beautiful home. Doesn't this just make you want to grab a book and sit by that fire? Cindy of Beaux R'eves shared her wonderful second home in Colorado and this link had 333 views. Thanks so much ladies for sharing your beautiful homes. You can grab a "featured" button from my sidebar. Looking forward to seeing all your "wows" tonight. These are three great features.All beautiful homes and lots of inspiration too! Three great choices. I absolutely love the fireplace. These are such great features! I could really curl up next to that fireplace. I love the simplicity of Barbara's entrance, and Marty has added just the perfect amount of color to her family room. Thanks for sharing! This is such a fun feature that you started posting each week. Always fun to see who drew everyone's attention! Kim...thank you so much for the shout out...I am both honored and thrilled to be included with such lovely homes. Have a wonderful day!!! I can understand why they were the most viewed. 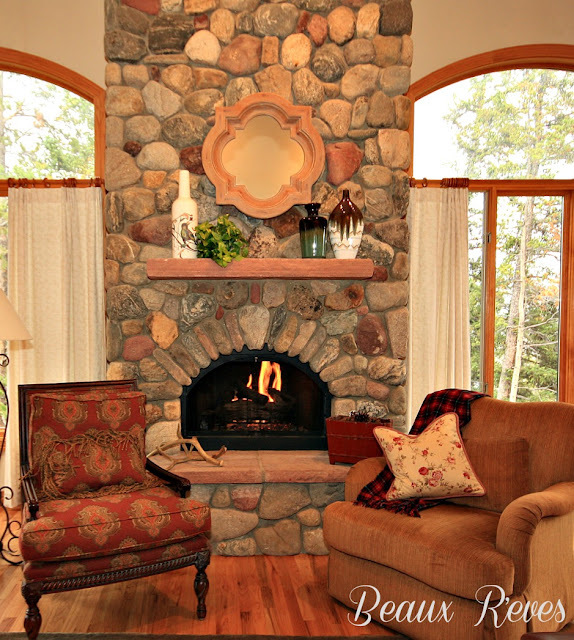 Love the rock fireplace! That green chair is wonderful. I guess I had better get busy and start my fall decorating. September is the most beautiful beach weather in California so I haven't thought about fall at all. Great top features Kim! !....Loved them all! I would kill for an hour to lounge by that amazing fireplace. Gorgeous!! What great picks, from such great posts. I would love to have a fireplace myself. Marty's room looks so inviting too. What beautiful features! I love Marty's room....it is so peaceful! Thanks so much and have a blessed day! See you tonight. Great inspiration. I need to let go of summer. Thanks Kim for always hosting such a great party! I am in great company with Marty's beautiful Living Room and Barbara's fab green chair in her entry! Kim, you throw an amazing party each week. Tons of stellar ideas featured! Thanks for hosting, Andrea b.